When our children were young, my best friend shared a VeggieTale movie with us saying, “Your kids will love it; mine do!” She was right, not only did they love it, but my husband and I enjoyed them too. The characters are fun to watch and the Bible stores come to life in a way that children find hysterical and memorable. The main characters Bob the Tomato and Larry the Cucumber are the perfect straight man/goofy guy combination. When these two are joined by the other cast members: Junior, the asparagus, Pa Grape, Mr. Lunt, the French peas, Mr. Nezzer, Archibald Asparagus, Laura Carrot, and more, the fun just gets better. There are songs, jokes, and a serious moment or two geared toward teaching children about the Bible. This is the story of Jonah and the whale with Archibald as Jonah, but the story starts out with Bob, Dad the Asparagus, Junior, Pa Grape, and Laura the Carrot riding along on a dark night in the wilderness heading for a concert for which Laura won a special ticket. Laura isn’t being very nice as she rubs in the fact that she, not Junior, won the ticket. With some freewheeling antics in the front seat, the van they are riding in goes off the road and down a steep bank where it lands near a lonely seafood restaurant. The party goes in to get help; the French peas, who are the owners of the establishment, greet them. While Dad Asparagus uses the phone, the others are seated at a table. As Junior picks up a menu, he notices an item that he doesn’t understand, “Compassion.” “What’s that?” he asks. At that moment, some Pirates, sitting in the booth next to him begin to explain with a story. Their story starts out with Jonah, who, after a day of proclaiming the current message from the Lord, receives his new assignment from God. “The pirates that don’t do anything (and I do mean anything)” looking for money to pay off their debt at the local snack stand, meet Jonah as he is running away from his mission to Nineveh, a dreaded city of evil fish slappers. Since they have a ship, Jonah convinces the pirates to take him to Tarsus, half a world away in the opposite direction — for pay; the pirates agree bursting out in song, “We are the pirates that don’t do anything.” Later, Jonah goes down below for some rest and meets Khalil the worm/caterpillar rug salesman, who deems himself Jonah’s travel buddy and the fun begins. Khalil the Caterpillar, is a silly addition to the character lineup, but seems to keep Jonah in line. The storm ensues, the whale consumes, and the rest is history. No spoilers here; the movie is highly recommended as a Lenten or Easter treat for the entire family — Jesus compared his 3 days in the grave to Jonah’s time in the whale. And you never know; you may even find yourself singing a silly song or two! 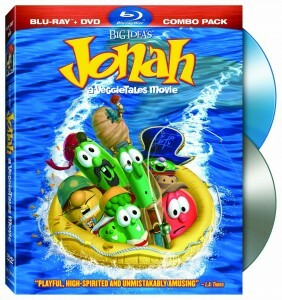 JONAH, A VeggieTales Movie is now out in Blu-ray/DVD Combo. Other formats are available .